My Adonis Lifestyle Journey began when I made the Watch List in Contest AT3. I received tremendous support from members of the AI/VI community to pursue my fitness endeavors. After winning the AT7 Open Level 2 Contest Category I'm inspired to support and motivate others to begin their own Adonis Lifestyle Journey. 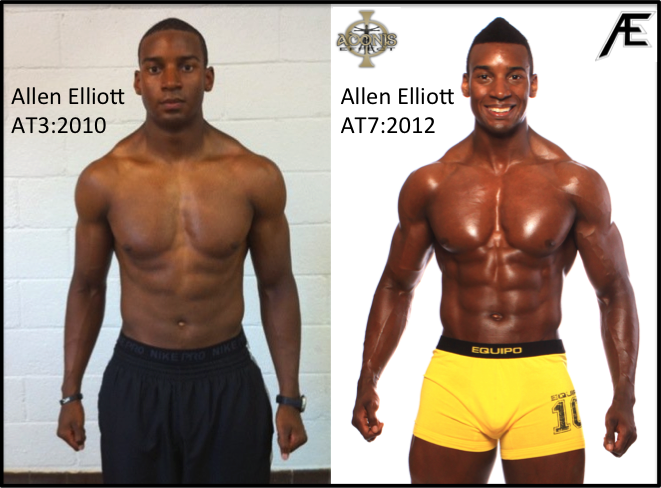 Hello, my name is Allen Elliott and I’d like to share my “Adonis Lifestyle” Story with you. While stumbling upon the Adonis Index website over three years ago, I could’ve never imagined the incredible amount of success and personal satisfaction this system has provided for myself and my fitness endeavors. As an ex-athlete, I’d hear the horror stories’ of guys who started off in great shape only to be de-railed later in life & never recovering. Now that training for performance was no longer a goal or requirement, I was desperately looking for direction. I found the Adonis Index Systems to be straightforward and applicable to anyone desiring to improve their overall “Look” as opposed to specific performance training. After completing the First Week of Workouts, I took the plunge and never looked back. Training exclusively with Adonis Index Systems, I have competed and placed with top honors in Natural Bodybuilding/ Men’s Physique Fitness Competitions, graced the runway in several prominent fashion shows, and have published work as a fitness model. Following the Adonis Lifestyle has given me unstoppable confidence to pursue my fitness goals with a relentless tenacity. When John contacted me and asked if I would like to become a guest blogger on the site, I was deeply honored and graciously accepted his offer. My Goal while giving back to the Adonis Index Community is to: Supply, Train, and Build. Supply–As a guest blogger, I will post helpful tips for contest preparation, provide insight on making the transition from an AI Contest to a “Live Show”, and share updates from my Journey in the World of Fitness Modeling. Train–I’ll also be active in the AI forums to chat with members about training styles, body-part specialization within the AI system, and any other topics that may arise that I can help with. Build–Preparing for the road ahead, John and myself are masterminding to bring you the next Adonis Index workout. This advanced workout will show you how I prepare for Fitness Competitions and Model Photo-Shoots, Adonis Index Style. As we carry forward the plans and programs to better help you achieve your fitness goals I’d like to remind you to enjoy your fitness journey, the results are worth the effort. Stay Tuned! The best is yet to come.